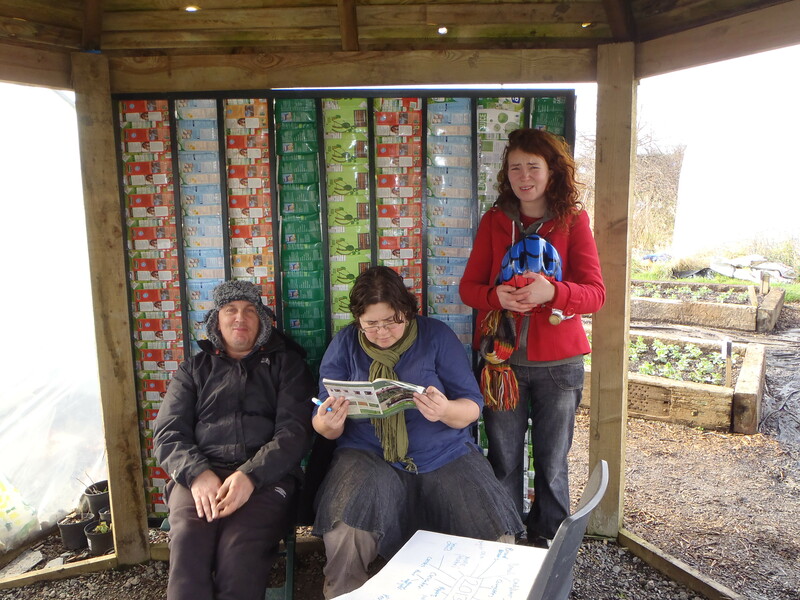 It’s a bit of a whirlwind down at the Golden Hill Community Garden at the moment as we leap into spring mode and start planting our first seeds and carrying on our building projects. The new beds are popping up like mushrooms! 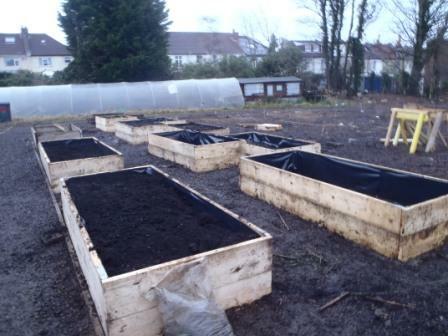 The raised bed building workshop was a great success, we had a lovely day and 9 happy participants got four fab beds built, increased their power tool confidence, left ready to build beds for themselves and we got a bit of money to cover the costs – Everyone’s a winner! So now I can announce our next workshop. 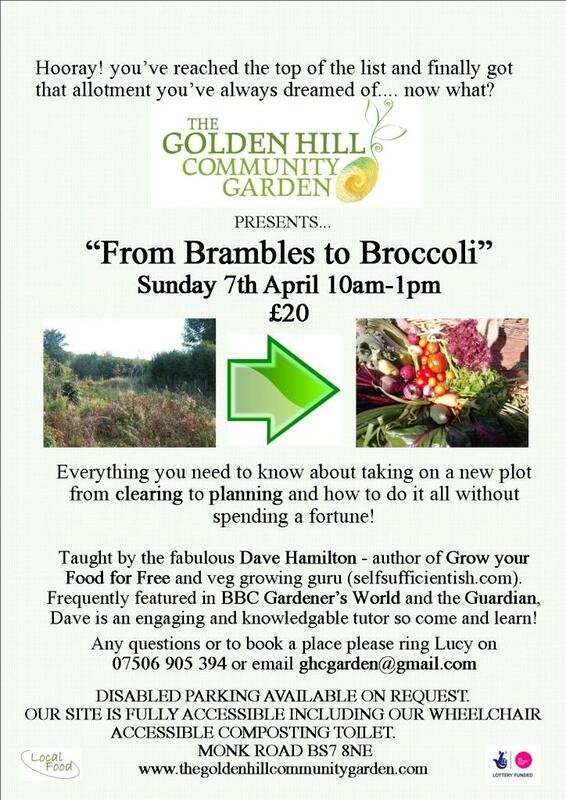 Published author, excellent workshop leader and all round nice guy Dave Hamilton will be teaching people how bring an overgrown plot into production without breaking the bank or too much back backing work. We’ve upped our prices but it’s still a bargain! It’d be great to get this poster up far and wide and if the workshop gets booked up we’ll run it again. So please print it out and put it up where you can – garden centres, notice boards at work or in cafes, allotment gates, etc. I’m happy to post you a poster if you don’t have a colour printer, or send one laminated if it’s going up outdoors. And if know anyone taking on a new allotment or struggling with an overgrown one then let them know. This would be a HUGE help. A reminder that this Wednesday is our first Volunteers Annual General Gathering (V.A.G.G!) at 3pm. Please come along and have your say about last year and give your ideas and opinions on plans for the year ahead. And finally another call out for plant fosterers – we need you! For tomatoes, chillies and aubergines. The big seed order is arriving this week and I’m happy to drop round with everything you need to get some little green guys growing at home. This is so vital – not just so we have fabulous veggies to eat this year but we need things to sell at our spring fair and planned market stalls. To take the pressure off no one person gets all of one variety or one vegetable so if yours don’t make it then it’s okay. All you need is a sunny windowsill and a little bit of love. So don’t worry if you’ve killed plants before or never had a go -if you’re worried about the planting bit I can talk you through it or even drop off ready planted trays. Then you get the joys of green shoots inside as the weather warms up outside as well as volunteering for the garden from the comfort of your own home. This entry was posted in News from the Garden on February 18, 2013 by GHCG. Lots of exciting goings on – Get involved!! Firstly…. 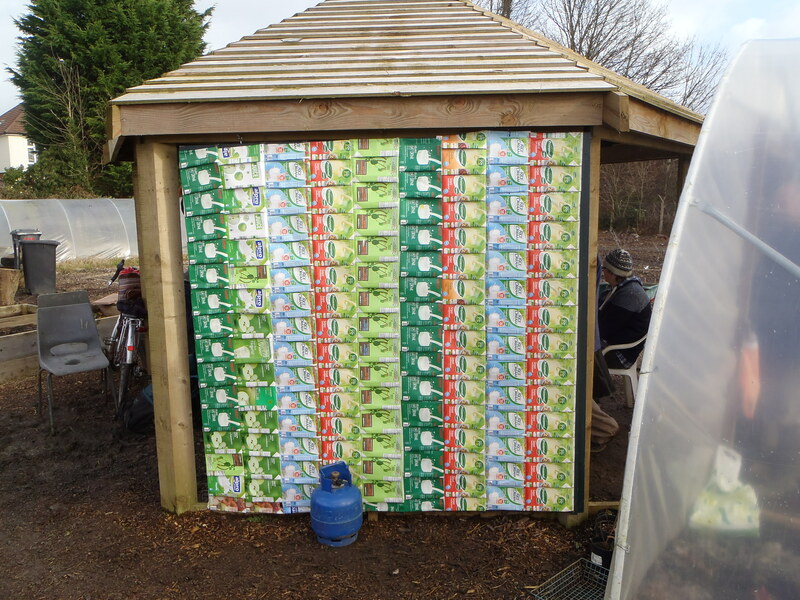 drum roll….. WE’VE FINISHED THE TETRA SHACK!! And it is everything we could have hoped for and more. It keeps the worst of the wind out of the shelter and looks fantastic (see attached) and there’s already talk about building another one. Thank you to everyone who helped collect them and a special thanks to Julia and Nikki who went the extra mile (and anyone else involved in washing them who came to know how bad an old soya milk carton can actually smell). Secondly we have having our Volunteer Annual General Gathering, and so volunteers are invited. It’ll be a chance to talk about the last year, and plans for the coming year and from this we hope to build a regular group of volunteers who meet monthly to make plans and have a say about the running of the open volunteering days at the garden. Our current lottery funding will finish March 2014 and we’ve started making about how we’ll keep going and everyone’s thoughts and ideas are welcomed. The plan is to have the meeting at the garden 3:00 20th February. I realise that a lot of people will be at work at this time and won’t be able to make it and if I hear from enough people then perhaps we can make it later or on a Saturday, but Wednesdays are always our busiest day with the people who have come most often through the year. Let me know if you’d like to come so I know how much cake and snacks to provide. Also last year we have fabulous tomatoes and chillies thanks to the efforts of our fabulous plant fosterers. All you need is a sunny windowsill and space to get a few plants started, this is especially important this year as we want lots of little green babies to sell as well as grow. Don’t worry if you’re not green fingered, we’ll provide everything you need equipment wise as well as advice and support. Let me know if you’re interested – it’d be a huge help to the garden and if you live nearby but can’t make it down I might be able to drop stuff off at your house. We have our first workshop tomorrow with lots of lovely people booked in to come and learn how to build raised beds Golden Hill Style and watch this space for more workshops in the pipeline. And while I have your attention the date for the spring fair has been set for11th May. Please pop it in your diary or on the calender and if you’ve any ideas of what you’d like to see at the fair then let me know. And finally I’ve bowed to the pressures of the modern world and set up us a Facebook page. So if you are someone who enjoys the distracting pleasures of Facebook then you can find us at at www.facebook.com/TheGoldenHillCommunityGarden. Free feel to ‘like’ us, comment and post photos etc. This entry was posted in News from the Garden on February 8, 2013 by GHCG.